SIZZLING (AUS) (Bay 2009-Stud 2014). 7 wins-5 at 2-from 1000m to 1600m, A$1,332,375, BRC TJ Smith S., Gr.1, Champagne Classic, Gr.2, Sires' Produce S., Gr.2, Queensland Guineas, Gr.2, Gold Edition P., L, GCTC Ken Russell Memorial Classic, L. Out of SP Admirelle. Grandson of SW Laudemio. Sire of Sizzling Belle, Sugar Sizzle and of the placegetters Burbank, Line Up Girls, Scorch, Sizzleonthebridge, etc. His oldest progeny are 2YOs. HOLD FOR RANSOM, by Oratorio. Winner at 1400m in Aust. Half-sister to BENNY'S BUTTONS, REAL SURREAL. Dam of two named foals, neither raced. BENNY'S BUTTONS (Refuse to Bend). 5 wins-1 at 2-to 1350m, A$498,100, BRC Vo Rogue P., Gr.3, Ascend Sales Dash H., Channel Seven H., Silky Smooth & Speedy H., 2d BRC Queensland Guineas, Gr.2, BRC Sprint H., Gr.3, Sunshine Coast Cup, L, BRC Lough Neagh S., L, Keith Noud H., L, Hinkler H., L, Qld Tatt's RC Australia Post S., L, Gold Coast S., BRC Gallopers $11.95 Meals H., Ticketek H., Qld Tatt's RC Hardy Brothers Jewellers H., BRC Brc.com.au 2YO P., 3d Sunshine Coast Guineas, L, BRC Daybreak Lover S., L, Ascot H., L, GCTC Prime Minister's Cup, L.
REAL SURREAL (Real Saga). 4 wins-3 at 2-to 1350m, A$1,408,750, GCTC Magic Millions 2YO Classic, RL, Ipswich TC Gai Waterhouse Classic, L, BRC Broncos 2YO H., Sirromet Love Sparkling 2YO H., 2d ATC Surround S., Gr.2, BRC Just Now H., L, 3d BRC New Sky Racing Iphone App 2YO H., 4th ATC Light Fingers S., Gr.2, BRC Bright Shadow H., L.
Dansolei. 2 wins at 1300m, 1350m, BRC Future Racing Network H., 3d BRC Courier Mail H., Skyracing.tv P.
Boom Chicka Boom. Winner at 1000m in 2017-18 in Aust. He's for Real. Winner at 1350m in 2016-17 in Aust. Langhro. Winner at 1200m in 2017-18 in Aust. Hold for Ransom. Winner. See above. GREAT CRUSADER (Our Maizcay). 8 wins-4 at 2-to 1200m, A$423,625, STC Todman Slipper Trial S., Gr.2, BTC City Rowers H., Brisbane Marriott Hotel Freshman 2YO H., Jupiters Gaming Flying H., Allan Campbell Memorial H., Horses Birthday H., GCTC Magic Millions 2YO Superbowl Final, Qld Tatt's RC Parcel Post 2YO H., 2d BTC Eric Kirwan 2YO H., Moraitis Flying H., Bin 555s H., 3d QTC Lightning H., L, GCTC Marina Mirage WFA Sprint S., BTC Transcontinental Hotel H., Churchie H., 4th BTC Summer S., Gr.3. Bold Reason (Singspiel). 9 wins-1 at 2-from 1050m to 1600m, A$361,200, BTC Kings Bloodstock H., David Reid Homes H., Cadbury Schweppes H., QTC Ambassador Travel 2YO H., BTC Mitty's H., BDO Kendalls H., Cleartel H., Thirsty Merc on 5 August H., QTC Tooheys New H., 2d BTC City Pacific Finance H., 3d BTC Bribie H., L, QTC Luke King Classic H., BTC Mater Pathology H., Mark & Steph H., Metropolitan Funerals H., QTC Desmain Pty Ltd H., 4th BTC George Moore S., Gr.3. Gay Adventure (Semipalatinsk). 3 wins-2 at 2-at 1200m, 1300m, A$153,500, BTC Rothbury 2YO H., Toowoomba TC Emerald Bracelet, JJ Atkins 2YO Quality H., 2d QTC Sir Douglas Wadley H., L, BTC City Rowers H.
Kardashing (Redoute's Choice). Winner at 2, A$99,300, in 2016-17, 2d SAJC Oaklands P., L, MRC Le Pine H., MVRC Odds Boost Exotics H., Follow @TheValley H., 3d MRC Comcater 2YO H.
Starstreamed. 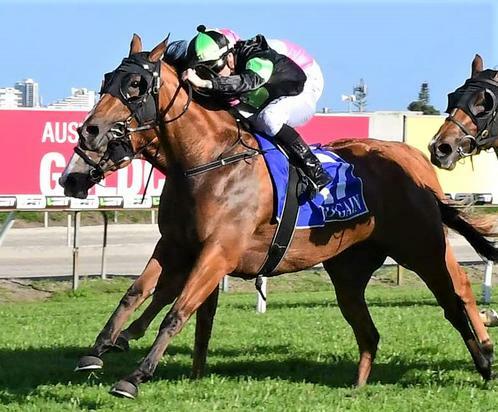 7 wins-1 at 2-to 1200m, A$151,150, BRC Number 1 in Racing 2YO H., 2d BRC Greg Grant 2YO H., OLHC Family & Friends 2YO H., Urban Event 2YO H., Mullins Lawyers H., Jim Beam H., 3d BRC Mullins Lawyers H., Qld Tatt's RC Tattersall's Arcade H.
Matineeidol. 4 wins to 1300m, 3d QTC Boxing Day at Eagle Farm 3YO H. Producer. Bataan City. 8 wins-1 at 2-to 1200m, 3d QTC Bill Stanley H., Lefroy H. Producer.